The best areas for Snowkiting in Michigan are wide open spaces with steady wind and few obstacles. Inland Lakes are a good option but how do you know if the ice is thick enough to be safe to ride? I was asking myself this question and compiled some information below that I’ll be using going forward. The Minnesota DNR has a good set of guidelines to follow. They note that ice is generally safe to walk on if it is at least 4 inches thick. Another useful table from the US Army Corps of Engineers says that ice is safe to ski on if it is a mere 1 3/4 inches thick. See below for their table. The above is only a guideline because ice quality is a major factor on how strong the ice is. Wikihow has the following guide to judge ice quality. “Light gray to dark black – Melting ice, occurs even if air temperature is below 32°F (0°C). Not safe, its weak density can’t hold a load, stay off. 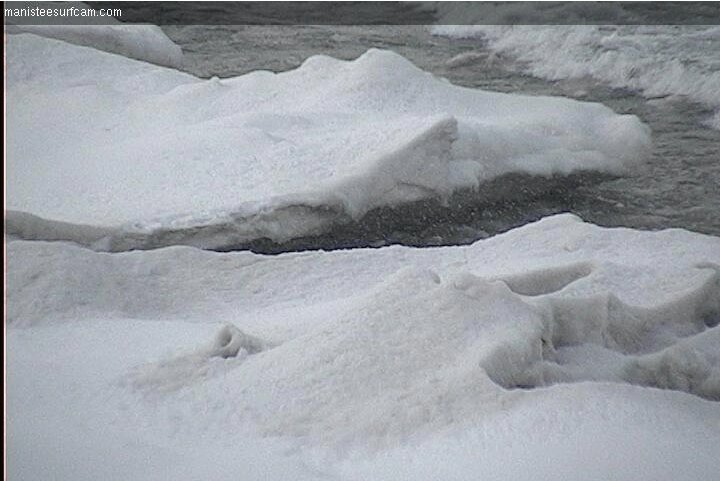 White to Opaque – Water-saturated snow freezes on top of ice forming another thin ice layer. Most times it’s weak due to being porous from air pockets. Blue to Clear – High density, very strong, safest ice to be on if thick enough, stay off if less than 4 inches (10 cm) thick. Also note that each body of water is different. Moving water under ice is less safe, saltwater requires colder temperatures to freeze, and larger bodies of water take longer to freeze. Before going out on the ice you need to test it’s thickness. If you aren’t an ice fisherman you probably don’t own an ice auger. Most people own or can get their hands on a cordless drill so the following is a convenient method. Use a long wood drill bit and a cordless drill to drive the bit through the ice. Use a tape measure to determine the depth of the ice. If the ice isn’t at least 4 inches thick do not proceed any further. Test the ice in several locations to make sure it’s at least 4 inches thick and note the quality of the ice. If the ice looks good then grab your gear and get ready to kite! Another safety tip from the Minnesota DNR is to carry a set of ice rescue claws. These claws help you get a grip on the ice to pull yourself out if you even fall through. They have a great guide and video on their website how to make your own. It’s also not a bad idea to wear a life preserver. This will keep your head above water if your limbs start going numb in the frigid water. Snowkiting on frozen lakes is a fun winter activity. Just be sure to take some basic precautions to stay safe on the water and if you are going alone(not recommended) make sure to tell someone where you are going and when you’ll return. Michigan Dawn Patrol is for people who love the Great Lakes. Subscribe now! so you don’t miss out our next adventure.